Carven Homme is a popular perfume by Carven for men and was released in 1999. The scent is spicy-woody. The production was apparently discontinued. Unbelievable value. Gorgeous, spicy and rich. Straight out of the gate, I was not a fan of this one. The cinnamon, ginger and tarragon on the top was just too much and burned my nose. I think the original remark I made was that it smelled like a jacket on fire lol. But underneath, I could detect a rich and full barbershop scent that was incredibly familiar. In fact, my first 3 thoughts were "OMG that's spicy", "OMG that's old fashioned" and "man that reminds me of something european". Whatever. That was a while ago. And like any good blind buyer, I bit the bullet and carried on. Several wearings later, my tune changed considerably. Although the spiciness still gets to me sometimes, it definitely blends well in the mid with the tonka bean, geranium and patchouli. There's only a tad bit of vanilla I can detect in the base, but the effect is to give it a sweet chai tea vibe. The barbershop feel probably comes from the lavender, but there's something genuinely "cosmetic" and gentlemanly about the smell, like something you would get from Dior, or even Jacques Fath pour homme. In fact, Fath pour homme could be considered the raspberry vanilla Coke version of this baby - distant cousins, and possibly worth layering. Overall, I see this as a cool weather scent, well dressed, sophisticated and wearing something wool. Perfect for anyone in the UK, and miles above Burberry London in terms of scent quality and depth. The only rub is the performance - rather modest, with only average projection and longevity - at least, on me. I really wish it lasted longer because this is something an experienced nose can really appreciate. 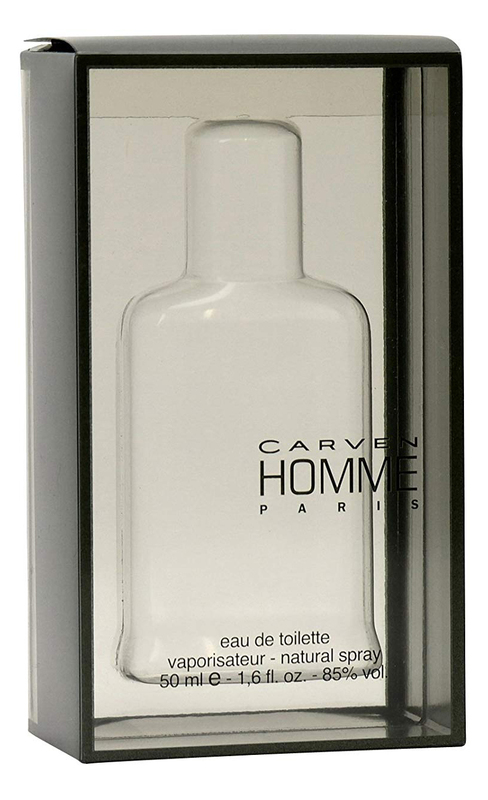 If Sauvage is your thing, Carven homme just might come off as too "old-timey" for your tastes. But not to worry, you'll get there eventually. The opening of Carven Homme is practically identical to Envy Men, to say the least, but it quickly takes a quite different path. Still it opens with a really similar, quite recognizable blend of citrus, ginger, sandalwood, cinnamon, lavender, pepper, violet, nutmeg: a sweet spicy-woody harmony with a creamy-powdery feel, rich and warm, mellow and easy-going. What strikes the most from the very first sniff is the astonishing quality of the notes: they smell intense, rich, “round”, with no synthetic or “plastic” flaws. 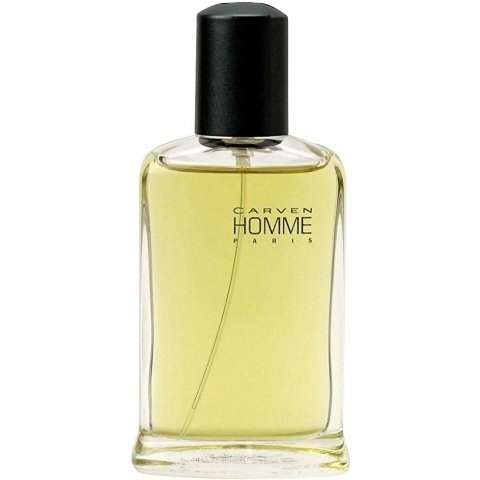 From the very first minutes Carven Homme shows its great, solid, pleasant personality: it’s discreet and classy in a versatile, effortless way, and since apparently this kind of woody-spicy-bright “sweet” designer scents which were quite “the cool thing” back around early 2000s is not really that “trendy” anymore, this fragrance is even quite distinctive – positively outdated, if you want. And above all, simply irresistible. You’ll just crave for it. The drydown is perfect: always a spicy-sweet sandalwood and cedar accord scented with lavender and rounded by amber, but with a hint of sharp tobacco and finished leather – something which emerges after a while. The tobacco note takes soon a prominent role, adding a fantastic touch of “sweet darkness” which perfectly enhances the overall spicy-powdery woodiness. So classy. 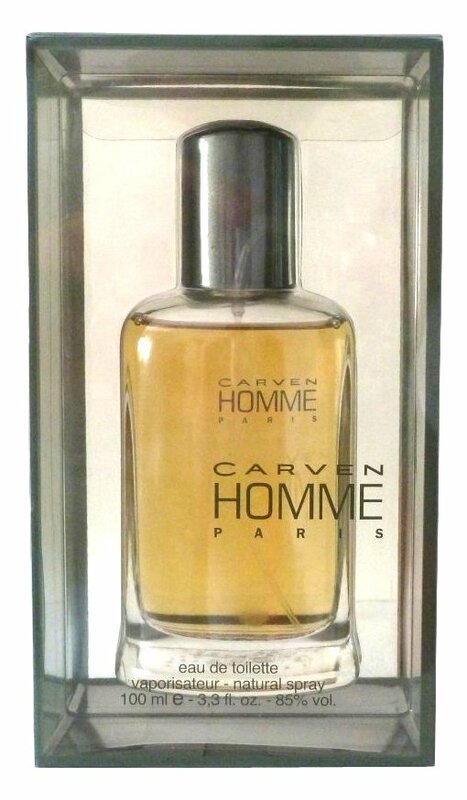 Besides Envy Men, I also agree on the slight similarity with Jaipur Homme: Carven is decidedly more spicy, more ambery-tobacco and more woody, with far less “dandy soapiness” – shortly a completely different mood; but there is undoubtedly a powdery-spicy-lavender feature here as well, which may make you think of some aspects of Boucheron’s masterpiece. Finally, the longevity is excellent to any extent: it lasts long, and never showing any syntheticness – it just keeps smelling rich, round and refined for hours. Perhaps not the most creative fragrance around, surely carrying a sort of “2000s trademark”, but the quality is so high it’s just irresistible. It’s warm, rich, relaxed, extremely versatile, one of those scents which you just don’t get tired of wearing. Good for any circumstance, as it bears different facets – it’s “dark” and sensual enough for a romantic dinner, but with that safe “woody cleanliness” which makes it perfect for office or cinema or whatever. Shortly, it smells *fantastic* and that’s it... we are so stuffed with artsy-fartsy niche crap, we’ve forgotten how rare this quality is – to smell *fantastic*. Terrific quality. Highly recommended.